Supernatural (featuring Smooth with Rob Thomas) Album reviews. it's not often that an artist who played at Woodstock releases an album in the '90s that sounds fresh and new. For that alone, Supernatural should be commended, but what really makes Carlos Santana's best album since the '70s so good is that rather than resting on his classic rock fame, he has made a brilliant and seamless transition into the '90s. Without sounding the least bit contrived, manages to incorporate musical styles from rock, pop, folk, R&B, and even a little rap into his unmistakably Santana latin-rock vibe. Which of course, he has done from the beginning, and thus becoming one of the few rock artists whose popularity knows no cultural or racial boundaries - even in today's fragmented popular music scene, the single "Smooth" has made it onto classic rock stations whose audience wants to hear what the man behind "Evil Ways" is doing now, alternative stations whose listeners dig the improvisational funk of Phish, Jamiroquai, G Love and anything of that ilk, top 40 stations who need some mid-tempo on their playlists, and even Spanish stations, much of whose music is derived from Santana's influence in the first place. "Smooth," featuring Rob Thomas on vocals, has consequently been one of the most inescapable songs of the year, but that doesn't detract from its quality. it's one of those songs that creates a mood all of its own - a steamy, persistent jam that doesn't go away, and some of the most soulful singing and guitar playing since� well, since "Evil Ways." But while we're on the subject of guitar, it should also be noted that Carlos Santana is often overlooked as the supremely talented and innovative guitar player that he is, because unlike rock's other guitar gods (Hendrix, Clapton, Page, etc�) he rarely lets his playing overshadow the song. What's great about many of the tracks on "Supernatural" is that he lets himself loose a little more and shows us all what an amazing guitarist he can be. 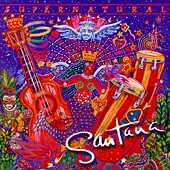 Particularly on the mostly-instrumental tracks, like the breakneck album-opener "Da Le Yaleo," the arena rocker "Migra," and the more traditional sounding "Corazon Espinado" (kind of an "Oye Como Va Part 2: Electric Boogaloo"), Santana returns to the immaculately constructed solos of his classic era, reviving that funk guitar sound with the slight wah-wah flavor that influenced so much of the great rock of the '70s, and come to think of it, the '90s as well (We'll forget about that decade in between). And let's not overlook Santana's great use of vocalists on this album. Apart from Thomas, he employs Lauryn Hill on the jazzy "Do You Like the Way," Everlast on the folkish "Put Your Lights On," Eagle-Eye Cherry on the Spanish funk piece "Wishing it Was," and Dave Matthews on the cool and breathy "Love of My Life." But the unity of the album does not suffer in the least - unlike when many other artists bring modern ringers in to help get their careers revived, Santana is still the boss in his case. This isn't an all-star album on which Santana happens to be playing backup on every song, it's a Santana album which happens to have a few other people on it. Perhaps it would be asking too much to expect this album to usher in a whole new era of cultural unity in music, but at the very least, Santana should finally start to get recognized as a giant on equal footing with the premier guitarists of the rock era, and his records of the early '70s can sit alongside Led Zeppelin 4 and Strange Brew with equal dignity. Supernatural, believe it or not, isn't far behind.